G. William Barnard is an associate professor in the department of religious studies at Southern Methodist University, Dallas, Texas. Barnard received his PhD from the University of Chicago. He is the author of Living Consciousness: The Metaphysical Vision of Henri Bergson (State University of New York Press, 2011) and Exploring Unseen Worlds: William James and the Philosophy of Mysticism (State University of New York Press, 1997); and is coeditor of Crossing Boundaries: Essays on the Ethical Status of Mysticism (Seven Bridges Press, 2002). He is also the author of numerous journal articles and book chapters that primarily focus on the philosophical and psychological implications of nonordinary states of consciousness. He is currently working on a monograph of the Santo Daime religious tradition. For the last several years, I have been researching the Santo Daime tradition, a relatively new Brazilian religion that draws upon folk Catholicism, West African religions, the Kardecist Spiritist tradition, neo-esoteric modes of discourse, and indigenous "vegetalista" practices and assumptions. The heart of the Santo Daime tradition is the sacramental ingestion of a psychoactive tea called the "Daime" (known in other contexts as ayahuasca, hosca, or yagé), which is said to open doors into spiritual realms, enabling Daimistas to commune in powerfully convincing ways with various spiritual beings. During the summer of 2010, I spent two months in Céu do Mapiá, an intentional "ecovillage" of more than 1,000 people located deep in the Amazon rainforest, which is the institutional center of the most well-known lineage of the Santo Daime. For the next stage of my research, I wanted to explore how this tradition that began deep in the Amazon rainforest has adapted itself to more urban settings. (The Santo Daime tradition was officially recognized by the Brazilian government in 1986 and since then has opened numerous churches throughout Brazil.) Therefore, with the invaluable assistance of the individual research grant that I received from the AAR, I flew into Rio de Janeiro on October 28, 2011. Not long afterwards I made my way to Lumiar, a small town about four hours north of Rio, where I spent several weeks participating in Santo Daime rituals with members of Mãe D’Agua ("Mother of the Water," a name that refers to Oshun, the West African goddess of fresh water and beauty). The community is led by Baixinha, a tiny, cross-eyed, highly revered, seventy-five-year-old Santo Daime and Umbanda matriarch. I was warmly welcomed into Mãe D’Agua. During my time there I took part in numerous Santo Daime rituals. One of the first took place in early November. The all-night dance ("trabalho"), called "Os Finados," was held in honor of the deceased members of the Santo Daime tradition. The dance took place in their large, open-air church, with at least two hundred members of the community in attendance. During this ten-hour ceremony, women gathered on one side of the church and men on the other, each wearing a distinctive uniform ("fardado"). Then, after drinking the bitter brown brew of the Daime (it was served several times during the night), we danced back and forth in predetermined steps, arranged in disciplined lines that had previously been painted on the floor of the church, circling the central altar ("mesa") that, like the church in Mapiá, had the shape of a six-pointed star. While dancing to music played by several guitarists and two extremely talented flautists, and while vigorously shaking our maracas (hand-held rattles), we sang the often hauntingly beautiful hymns of the four closest disciples of Mestre Ireneu, the seven-foot-tall Afro-Brazilian spiritual healer and poet who founded the Santo Daime tradition in the early part of the twentieth century. Daimistas believe that these hymns were "received" by his disciples from the "astral world"; they had been memorized by many of the participants. 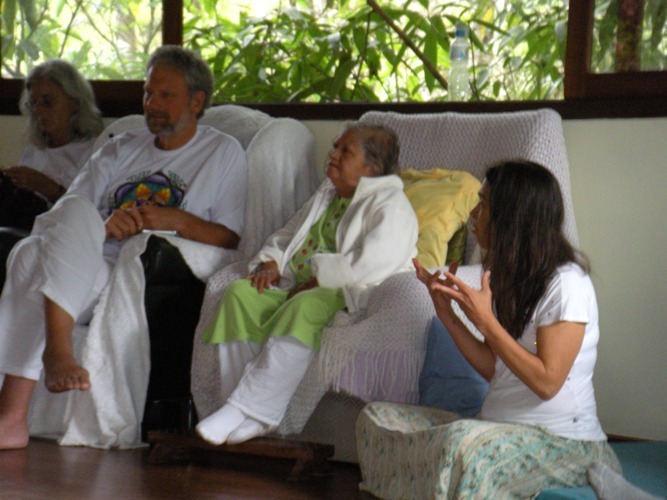 During my time with this community, I also had the opportunity to take part in numerous extremely intensive healing works that occurred in the intimate setting of the sacred space ("salão") of a nearby retreat. Baixinha was present throughout these less structured rituals in which certain individuals, after drinking the Daime (there were typically three servings during the daylong process), frequently "incorporated" various spiritual entities, while others in the group continued to sing a wide variety of hymns. During these incorporations, which were often quite dramatic (e.g., lots of shaking, shouting, whistling, crying, or wild dancing) individuals voluntarily allowed their bodies to become the vehicles of either "higher" beings, especially "caboclos" (Native American spirits that came to heal the mental or physical illness of those in attendance) or various "suffering spirits" (the souls of people who had died and yet remained trapped in a sort of limbo world due to their various unprocessed negative emotions). These suffering spirits incorporated in order to receive the redemption that came from drinking the Daime, which is understood by Daimistas to embody the spirit of Christ. Before her exposure to the Daime, Baixinha had for decades been a "Mãe de Santo" or religious leader within Umbanda, another syncretistic Brazilian religious tradition. She is, at least arguably, the originator of "Umbandaime," a highly potent fusion of Umbanda and the Santo Daime tradition. I took part in two Umbandaime rituals during my time at Mãe d’Agua. The first was an eight-hour "gira" that took place in Baixinha’s church. This evocative ritual was propelled by the ongoing intricate beats of numerous African drums, the stirring melodies of the "pontos," or invocations that were specific to each incorporated being, as well as often wildly intricate clapping. The gira was also given an extra boost by the Daime, which everyone in attendance drank at the beginning of the ceremony (there were, again, probably close to two hundred people present). 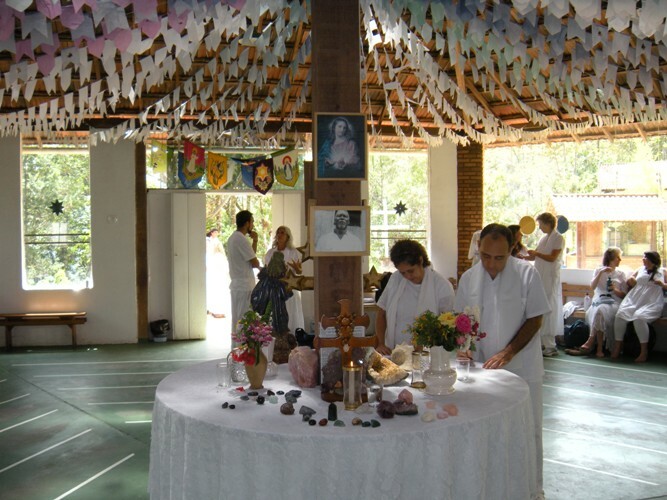 After this sacramental communion, numerous mediums trained by Baixinha incorporated the spiritual presence of various beings that are revered within Umbanda. One by one, different types of beings were summoned and would manifest themselves in the center of the circle, either wildly spinning or laughing or dancing, or calmly and carefully working to heal those in the "audience" who stood along the edges of the circle, clapping and singing. The beings who were summoned, and then eventually dismissed, included not only caboclos, but also the compassionate, elderly "preto velhos" (the spirits of former slaves who sat on small wooden benches, smoking pipes, and dispensing kindly advice); "criancas" (the spirits of children who died early and brought a boisterous spirit of abandon and fun into the church); and the energies of various "orixas" (divinized forces of nature, such as Xango, god of thunder, or Iemanja, the queen of the sea). Towards the end of my stay I was also able to take part in a more focused "girinha" ("little gira") that had a similar format to the lengthier gira, but which took place in the more intimate setting of the salão at Mãe d’Agua. There were still approximately eighty people present for this highly charged ceremony, in which numerous people who were rather new to the phenomenon of mediumship were given a firsthand experience of what it felt like and were soon spinning and twirling around the room along with numerous more experienced mediums. My three-week immersion into this often wildly expressive religious world was just the beginning. I was able to continue my research into the Santo Daime during a three-month return visit to Brazil, beginning in January 2012, in which I was able to participate in numerous rituals in three different Daime churches, and continued to interview several key Santo Daime elders about the historical unfolding of this intriguing new religious movement. All of this research was, either directly or indirectly, made possible due to the generous funding that I received from the American Academy of Religion.